The Holy Week break is over and tomorrow...I will be reporting back for work. Goodbye late night movies and siestas. But before I finally bid goodbye to my almost one week vacation, allow me to share with you more pictures of how I spent the past days. The leaves and the soil looks so dry because of the intense weather condition in my country. It's summer here and the temperature do not favor planting. But in God's time and Tita Emy's perseverance, I know she could turn this picture to a green and healthy garden. It might take months before my family will be able to visit Tita Emy again. But on our next visit, I am very optimistic that Tita Emy's green thumb can turn great wonders for this garden. I don't often see this especially in the city. During our visit, Tita Emy also treated us with healthy and the best tasting Filipino foods. We call this "Sapin Sapin." In English, the term is literally translated as layers.It is called Sapin Sapin because it is made of layers of different colors. Sapin Sapin is made of glutinous rice, coconut milk and sprinkled coconut flakes. Sapin Sapin is cooked manually and this is what I appreciate about it. The process include the careful selection and endless mixture of all the ingredients to produce each different layer. Unlike those that are sold in bakeshops, what I love about the home made Sapin Sapin is its presentation. The traditional Sapin Sapin is placed on a "bilao" (winnow) on top of fresh Banana leaves. I spent my Holy Week vacation mostly at home with my family. Today is Easter Sunday and to start the week right, I attended the Easter Mass with my mother. Christ has risen to let us know that we are saved. Come with the celebration of the Easter Sunday, I pray that I shall also rise from all those sadness, worries and miseries. In God's time, I hope.. I will be fine. Diane what a lovely post! The dessert looks lovely served on the banana leaves! Boiled peanuts are very popular here in Alabama. We can usually buy them in roadside stands. It is almost 6AM, and we are on our way to the Easter sunrise service. Oh, and post pics of your aunt's garden next time you visit her! 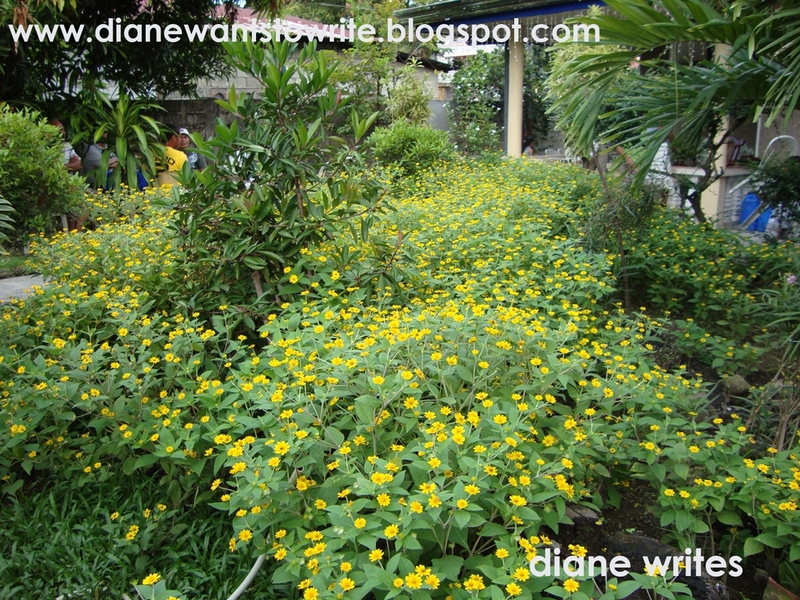 Gardening posts are among my favorites in blogland lately, LOL! Your blog all the way from the Philippines is very interesting. Have a blessed Easter. Thank you so much for your visit and for this "garden" post as well! May this Easter season carry a special gift and grace for you as your comment has been to me! Thank you for your kind visit. Yes, that is me. It's our wedding day in Florida over 12 years ago. Whew! Time flies by doesn't it? and... the pictures from your Tita Emy's house are gorgeous... her harvest looks like it is delicious and it looks that she is going to have a boutiful garden in the near future!